Our Pahoa vacation rentals offer the ideal setting to take in the Big Island's beauty and adventure. Originally a lumber and sugar plantation town, Pahoa still retains much of its historic character providing everything you need for a relaxing and luxurious Hawaii vacation. Hawaii Volcanoes National Park is a one-hour drive from Pahoa and takes you into an otherworldly environment of massive summit craters, steam vents and lava tubes. Enjoy spectacular views from the summit of Kilauea Volcano, hike through the Thurston Lava Tube and view ancient Hawaiian petroglyphs carved into rocks. Stop in a the Kilauea Visitor Center and Jaggar Museum to learn more about volcanoes and this diverse Big Island region. The Lava Tree State Monument just south of Pahoa provides a fascinating look at areas where native trees were encased in in lava by volcanic eruptions in 1790 and now remain as standing lava tubes. Kalapana at the end of the road provides views of the area where lava often flows into the sea sending up clouds of steam. Visit Hilo to explore the town and see Rainbow Falls, and follow the Hamakua Coast to Akaka Falls and the Waipio Valley Lookout. It's just a short drive from Pahoa to Kalapana where you may see lava flows pouring into the ocean. Also close to Pahoa are the turquoise waters of Kehena Beach where dolphins and sea turtles are frequently seen, as well as humpback whales passing by offshore during the winter months. 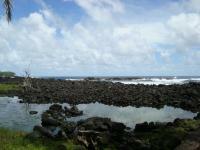 Visit Hilo town for fun family beaches that are popular for water activities like snorkeling and bodyboarding. Pahoa offers numerous dining choices from pizza to Thai food, Filipino and Italian. Check out Clemente's Italian Cuisine, Black Rock Cafe, and the Pahoa Chop Suey House. There is also a fish market and grocery stores to stock up on supplies. For fresh fruits and vegetables in Pahoa check out the Farmer's Market on Sunday mornings in the parking lot of Pahoa's Akebono Theater, Hawaii's oldest theater, where you enjoy some fresh-roasted Big Island coffee often to the accompaniment of live music. Drive up to Hilo town for a diverse array of dining choices near Hilo Bay. Pahoa town is reminiscent of an Old West cowboy town and today you can browse along the raised wooden sidewalks and Victorian-style storefronts in restored buildings that are home to interesting shops and art galleries. Surf shops, clothing stores, a pharmacy and boutique gift shops featuring the crafts of local artisans can all be found in historic Pahoa town. For more shopping explore downtown Hilo where you will find a wide variety of shops from boutique stores to art galleries. A rental car is recommended when staying in Pahoa vacation rentals so you can explore the region's many interesting attractions and beaches as well as day trips to Hilo town, Hawaii Volcanoes National Park and the Kona Coast. The island's bus service, called Hele On Bus, is free and stops at various points around the island including transportation between Kona and Hilo every day except Sunday. The Pahoa area is known for its sunny weather with average daily temperatures around 77 degrees F., perhaps a bit hotter in the summer and a bit cooler in the winter, with nighttime temperatures dropping about 15 degrees. Overall the Big Island weather remains relatively stable all year around with the Kona and Kohala coastlines on the western shore being the warmest and driest and Hilo on the northeast shore being cooler and wetter. Ocean conditions vary widely at Big Island beaches with many areas exposed to strong currents and potentially dangerous surf, particularly during the winter months. Numerous beaches provide good protection from the open ocean and provide safe areas for swimming and snorkeling. Visitors are urged to only visit lifeguarded beaches for water activities and heed all posted warnings. Check with lifeguards about the safest areas to participate in the activities you choose. Pahoa vacation homes provide the optimal way to enjoy your Hawaii vacation with all the luxuries of resort living and all the comforts of home including nearby shopping, dining and entertainment. Browse through our Pahoa vacation rental listings to get an understanding of the different amenities and property features we offer. We take pride in having the largest selection of high-quality vacation rentals in Pahoa, and also in the fact that we stand behind our product and make sure only the best of the best properties are listed on our site. If you have questions about our Pahoa rentals or which destination is best for your vacation needs, please give us a call and we will be happy to assist you. Pahoa was a major Big Island commerce and trade center at the turn of the 20th century, located at the crossroads of the old Island railroads and important to Hawaii's sugar industry. Today this area is known for its tropical flower farms and also grows lots of papaya, a popular local fruit many people enjoy with their breakfast.